Apple on Thursday rolled out its two-step authentication system, including verification via SMS, for Apple ID users in Canada, France, Germany, Italy, Japan and Spain. First spotted in Germany by Caschys Blog, Apple's list of countries in which two-factor authentication is supported has been updated. The company's FAQ page regarding the service has also been modified to reflect the changes. First rolled out in the U.S., Australia, Ireland, New Zealand and the U.K., Apple's opt-in two-step verification system provides an extra layer of security to Apple ID account holders. The six new locales added to the original launch group represent the service's first official expansion since it went live in March of last year. 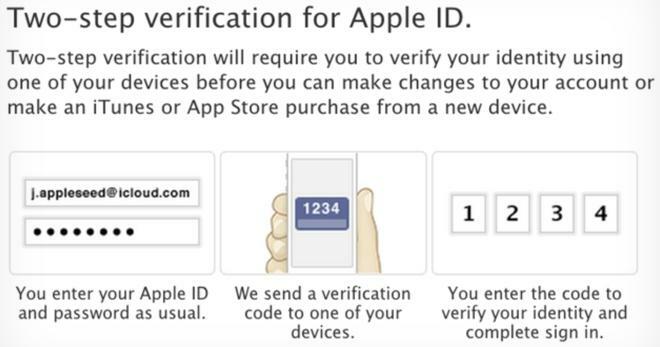 When activated, users are required to enter both a password and a unique four-digit verification code when making changes to their Apple ID or conducting iTunes purchases from a new device. Codes are sent out to trusted devices via the Find my iPhone app or SMS text. In May of 2013, users living in many of the same countries added to Apple's list today reported activation of the service, but access only lasted a few hours. The brief uptime prompted speculation of a premature launch. As a user's Apple ID is carried across iTunes, iCloud, the Online Apple Store and even Apple Support, securing the asset is of the utmost importance. Apple's two-step verification system is a major security feature that protects against credit card theft, reactivation of a stolen device and more.